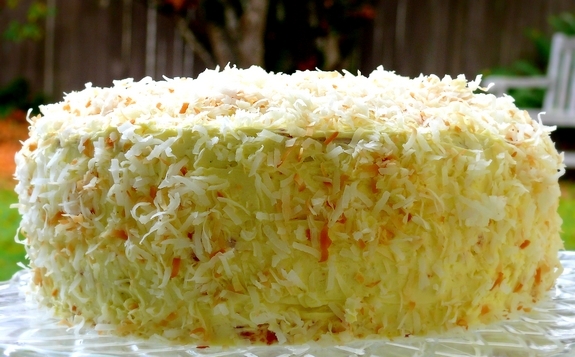 If there is a special occasion or a special someone you are going to make a cake for….I highly, highly recommend this Toasted Coconut Cake with Coconut Filling and Coconut Buttercream. It is absolutely fantastic and kind of unreal. I saw this cake made on Throwdown and it has always been in the back of my mind. Thanksgiving was the perfect excuse to go baking wild and this cake made its appearance. I wish I had a picture of the four-layered inside…but by the time we cut into it, the sun had gone down and well, you know how that goes. But the cake…it’s fantastic, just incredible….I would do anything for another piece. One of the best flavors in this cake came from using real vanilla bean and the Malibu rum. Full disclosure…this is a time consuming recipe, with many steps and somewhat advanced in skill. I say that only because you have to make custard, which some people have a hard time with. But it’s worth every minute of time spent. Just the best cake ever. First, make the simple syrup by bringing water and sugar to a boil. Stir in the coconut, remove from the heat and let sit for at least 30 minutes. and up to 4 hours. Strain the liquid int a clean saucepan, bring to a boil and let cook until the mixture is slightly reduced, about 15 minutes. Let cool. 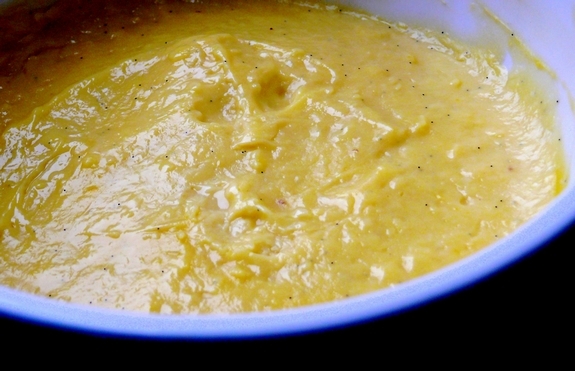 For the custard, combine the milks and vanilla bean seeds in a medium nonreactive saucepan and bring to a simmer over low heat. Whisk together the yolks, sugar and cornstarch in a large bowl. Slowly whisk the warm milk into the egg mixture then return to the pot over medium heat and bring to a boil, whisking constantly, until thickened. Scrape the mixture into a bowl and whisk in the rum and vanilla extract. Let cool to room temperature then cover with plastic wrap and refrigerate until cold, at least two hours or overnight. For the cake, preheat oven to 350o F. Butter and flour 2 ( 9 x 2 inch) round cake pans. Whisk together the milk, egg whites, vanilla bean seeds and vanilla extract in a medium bowl. In the bowl of a mixer fitted with the paddle attachment, mix together the flour, sugar, baking powder and salt. With mixer running at low speed, add the butter, one piece at a time and continue beating until mixture resembles moist crumbs. Add all but 1/2 cup of milk mixture to crumbs and beat at medium speed until the mixture is pale and fluffy, about 1-1/2 minutes. With mixer on low speed, add remaining 1/2 cup of the milk mixture, increase speed to medium and beat 30 seconds more. Scrape sides of bowl and mix for 20 seconds longer. 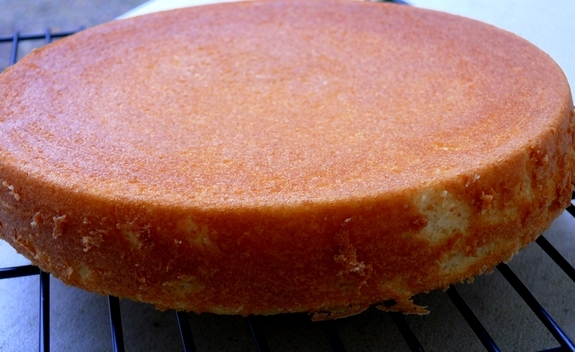 Divide the batter evenly between the cake pans and smooth the tops using a rubber spatula. Bake until a toothpick inserted into the center comes out with a few crumbs attached, 22 to 24 minutes. Cool in the pan on baking rack for 10 minutes. Run a small knife around the side of the pan and invert cakes onto the baking rack and let cool completely. For the coconut filling, combine the custard and cream in a bowl and whip until soft peaks form. For the buttercream, beat the butter and sugar in a stand mixer fitted with the paddle attachment until light and fluffy, about 4 minutes. Add the coconut custard and salt and beat until combined and smooth. 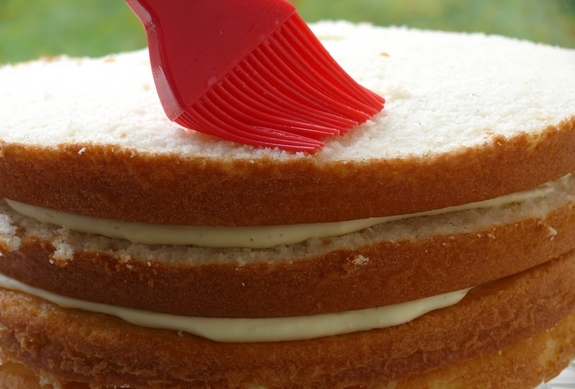 To assemble the cake, using a long serrated knife, slice each cake horizontally into two layers. Reserve 1 of the flat bottom layers for the top of the cake. Place another layer on a cardboard round cut side up and brush with some of the coconut simple syrup. Spoon 1/3 of the coconut filling onto the cake and using a small offset metal spatula, spread it into an even layer, leaving a 1/2″ border around the edge of the cake. Repeat with 2 more layers. Brush the cut side of the reversed cake layer with the remaining syrup. Place the layer cut side down on the top of the cake. Frost the sides and top of the cake with the buttercream. 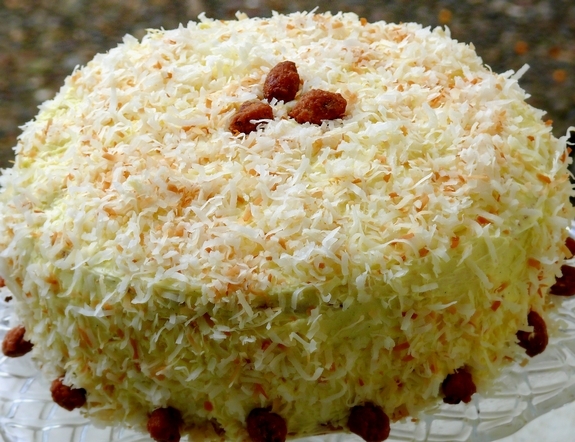 Pat the coconut onto the sides of the cake and sprinkle the remaining coconut on the top of the cake. 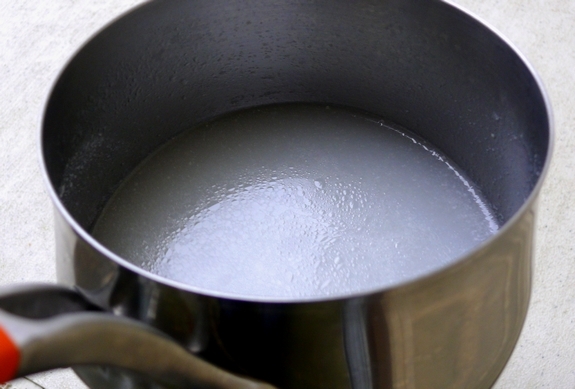 First make the simple syrup by bringing water and sugar to a boil. Stir in the coconut, remove from the heat and let sit for at least 30 minutes. and up to 4 hours. Strain the liquid int a clean saucepan, bring to a boil and let cook until the mixture is slightly reduced, about 15 minutes. Let cool. For the cake, preheat oven to 350 degrees F. Butter and flour 2 ( 9 x 2 inch) round cake pans. To assemble the cake, using a long serrated knife, slice each cake horizontally into two layers. Reserve 1 of the flat bottom layers for the top of the cake. Place another layer on a cardboard round cut side up and brush with some of the coconut simple syrup. Spoon 1/3 of the coconut filling onto the cake and using a small offset metal spatula, spread it into an even layer, leaving a 1/2" border around the edge of the cake. Repeat with 2 more layers. Brush the cut side of the reversed cake layer with the remaining syrup. Place the layer cut side down on the top of the cake. I love this cake! It takes forever to make but is worth it! mmm, i so remember that one. a lot of effort but so worth it. A beautiful cake. Sometimes you just have to put a little more effort into something and it turns out to be so worth it. I wish you had cake left-over also. I just might fine a flight and come see you. Wow! This looks sooooo delicious! Beautiful job Cathy. I can’t wait to try it. i love coconut cakes, and bobby’s recipe is one i’ve had bookmarked forever. my goodness, it looks magnificent. My daughter wants this for her wedding reception of 12 people in Boston on Dec. 27th. We are from out of state. Anyone know how I can get someone in Boston to make this specific cake. She is crazy for Coconut Cake with buttercream!!! Dang, was this a fun cake to make and a perfect crumb. 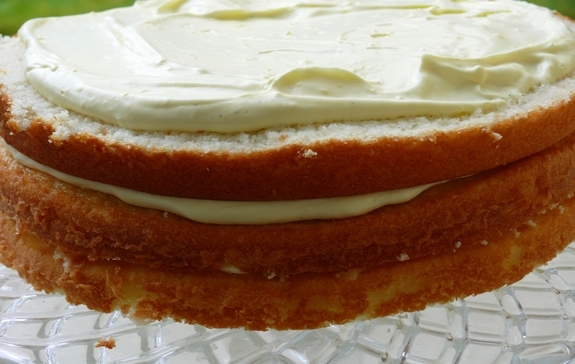 Does the completed cake need to be refrigerated (because of the custard)? Making this TODAY! looks amazing! I made this awesome cake and it was sheer perfection. Yes, It is a labor of love but fun and challenging. WHEN I make it the next time, I will do parchment in my my cake pans on the bottom and also do a ring around the sides. I will also make some cardboard rounds for ease of handling, this cake it worth it!! I will also reduce my simple syrup down further and use it all. I did add additional powdered sugar to the frosting as it was too buttery and I cut the thickness down with a little coconut milk which worked great. The crumb on the cake was excellent. I am thinking of making this cake for a burthday. I live in Toronto. I do not know where to get the vanilla bean, firstly. Is there any substitute in case I cannot manage to find this here? Also, can you clarify for me this 12 tablespoons of butter slightly cold cut in 12 slices? I do not understand if each tablespoon has to be cut in 12 slices or the 12 tablespoons are the 12 slifes. Can you also give me a weight size of the butter? Vanilla beans are available in almost all stores or online, there is really no good substitution for the flavor. A regular stick of butter here in the United States is 8 Tablespoons. Just cut your butter into smaller slices. Do you have any suggestions for high altitude adjustments to this recipe? I live at 5200′ above sea level, and would like to try this recipe for an upcoming birthday celebration! It looks divine! I’m sorry I do not. Have never baked in a high altitude kitchen. Do you use canned coconut milk or the one in the dairy dept? I have made it before and it is wonderful. I used the canned milk, but always wanted to double check and the video is not available online…thank you for the photos..